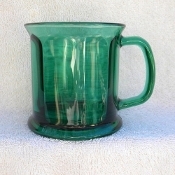 Vintage From Paul is delighted to offer these festive Vintage Green Glass Paneled Oversized Mug. The deep green glass has rounded panels with a slight curve at the lip. These lovely mugs have imprinted on the underside "Made In U.S.A. ". Each available mug is in Pristine/New condition with no defects noted. These mugs were never used! The Mug stand 3-3-4 inches in height, measure 3-5/8 inches in diameter and they have a generous 13 fluid ounce capacity.